Physical Characteristics: Largest species of Pacific salmon family, averages 33 – 36 inches long and 10 – 50 pounds; possible to grow to 5 feet long and over 100 pounds. Blue-green, red, or purple on back and top of head with silvery sides and white belly. Black spots occur on tail and upper half of body; mouth is often dark purple. During mating season they develop a reddish tint around dorsal fins and tail. Males have distinctively hooked mouth. Diet: Juveniles feed on aquatic invertebrates, including crustaceans and amphipods. Adults ingest smaller fish. Habitat: Needs fast-moving, fresh water streams and rivers. Oxygenation stimulates algae growth and other aquatic life which ultimately feed salmon. Needs clean, cool, sediment-free water to keep water temperatures low. Also needs intact riparian zone to protect smolts and juveniles. Adult salmon live in ocean and adapt to varied environment. Range: Found in cold, upper reaches of Pacific Ocean, from west coast of United States/western Canada and Alaska to Russian and Japanese waters. Clearwater Basin provides excellent spawning grounds in summer – often referred as summer Chinook. Fall Chinook run also occurs in lower Clearwater. Reproduction: Maturity is reached at 3 – 7 years; at that point they journey upstream to natal waters – sometimes several hundred miles. Male/female may spawn at original birthing grounds. Female digs nesting hole (redd), and deposits thousands of eggs before male releases sperm. Male/female guard eggs during incubation, then adults die. First year or so (juveniles) stay in freshwater environment, moving gradually to estuaries, then open ocean. Threats: Chinook salmon are listed as endangered, with abundant threats including overfishing, diversion and overuse of water resources, dams that alter the speed of water flow and block essential spawning routes, and habitat loss due to development. 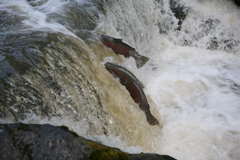 However, the spring/summer runs in the Clearwater are not listed because there is uncertainty as to whether these salmon are from natural migrants or from planted fish that came from Salmon River stocks. Miscellaneous: Other commonly used names for this species are King salmon, Quinnat salmon, Spring salmon, and Tyee salmon. Native American tribes of the Pacific Northwest have teamed with state, federal, and academic groups to protect the species, improve habitat and facilitate natural processes. Chinook salmon were enthusiastically described and eaten in the journals of Lewis and Clark. The expedition first encountered the fish as a gift from Chief Cameahwait, brother of Sacajawea. At the first taste, the explorers were convinced they had crossed the Continental Divide. Learn more about efforts to recover Chinook salmon and steelhead.